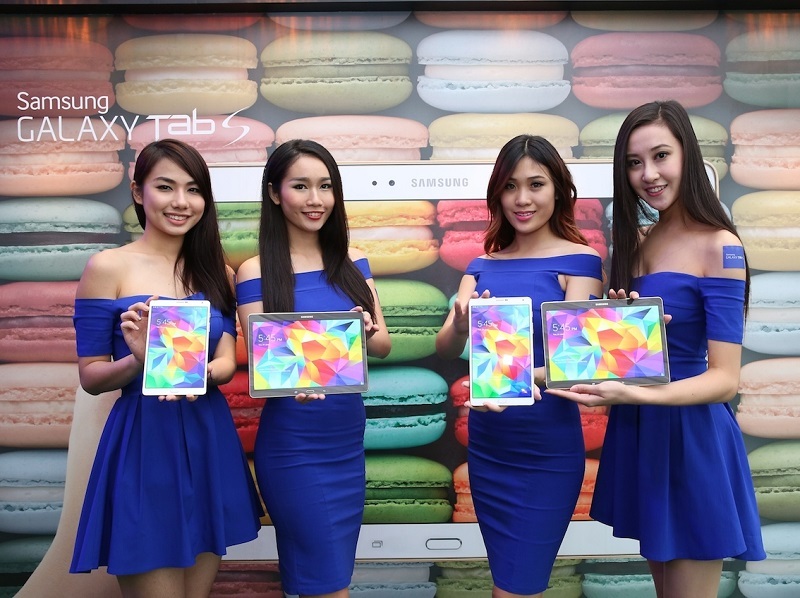 Models posing with the new Samsung GALAXY Tab S 10.5-inch and 8.4-inch, which are respectively the brand’s thinnest and lightest tablets to-date. Today Samsung Malaysia have unveiled the most anticipated tablet till date that features Samsung’s trademark Super AMOLED display.The Samsung Galaxy Tab S 8.4″ and Samsung Galaxy Tab S 10.5″ priced at RM1699 and RM1999 respectively. The tablets will be available to purchase around first to second week of July 2014 in Malaysia and it will be LTE variant which surprisingly it would be the one powered by Samsung’s own octa core processor, the Exynos 5 clocked at 1.9GHz quad core + 1.3GHz quad core. No news with the WiFi variants yet in Malaysia, but it will be coming very soon for sure. There will be two colors to choose from when you plan to get one at retailing stores which is either Titanium Bronze or Dazzling White. I personally fell in love with the Titanium Bronze color as it blends perfectly with the dotted back design. I have spoken very detail about these two tablets in my Samsung Galaxy Tab S introduced with Super AMOLED screen post. You will have the whole idea regarding the tablets if you have no idea about it, so feel free to read that post as well. On top of that, Samsung Malaysia also introduced the Samsung Level Series that you could also read up on the link of post above. For the pricing, the Samsung Level Over is priced at RM1399, Samsung Galaxy Level On will be priced at RM699, Samsung Level In will be priced at RM559 and Samsung Level Box will be priced at RM659. All of these audio gadgets are already available in any Samsung retailers near you, so feel free to try it out and start falling in love with the Samsung Level Over as it features Active Noice Cancellation. Oh last but not least, all the freebies given previously when you purchase an Samsung Galaxy S5 still remains and if you have no idea what are those, head over to my previous post here. Next ArticleAMD launches AMD FirePro W8100 8GB GDDR5 UHD graphics card.